IAAPS and the Ritsumeikan Center for Asia Pacific Studies (RCAPS) will jointly hold the 14th Asia Pacific Conference at Ritsumeikan Asia Pacific University (APU), Beppu, Japan on 5-6 November (Saturday and Sunday), 2016. The theme is "The Changing Asia Pacific: Sharing Knowledge, Shaping the Future" We are currently calling for presenters. Please click here for more details. The application deadline has been extended to August 31. Asia Pacific World (Volume 6, Number 2) has now been uploaded to the IAAPS website. 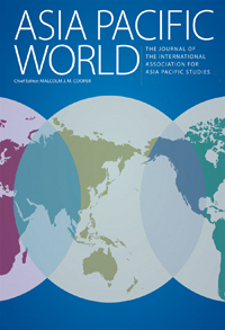 Asia Pacific World (Volume 6, Number 1) has now been uploaded to the IAAPS website. The proceedings of the 5th IAAPS Annual Conference have been uploaded to the web. A new IAAPS Board of Directors was appointed. Please click here to view the make-up of the current board.